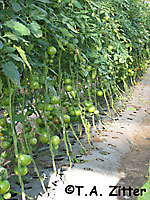 The renewed interest in growing and sampling of freshly harvested tomatoes has never been greater. 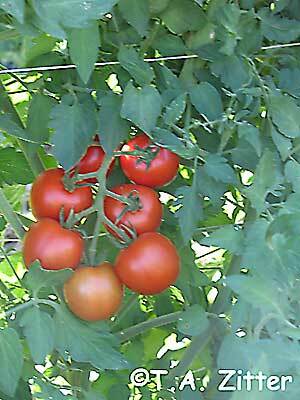 Check any garden catalogue and you will find page after page of tomatoes in many colors and sizes. Beefsteak tomatoes still exist, but consumers are discovering or rediscovering heirlooms, grape, cherry, saladette, greenhouse, and not to mention the typical fresh market reds. 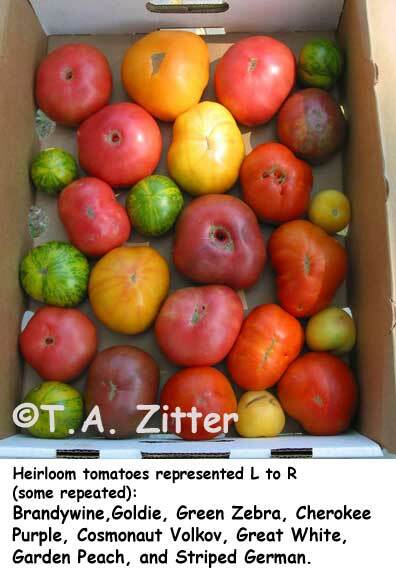 Heirloom tomatoes represented L to R (some repeated): Brandywine, Goldie, Green Zebra, Cherokee Purple, Cosmonaut Volkov, Great White, Garden Peach, and Striped German. Thanks to all the contributors, present and past, for making the images available to make the key as useful as possible. If you have any images that you would like to add with your own copyright added, please let me know. (taz1@cornell.edu) I’m sure the worldwide readership would be appreciative. Gabor, B., and Wiebe, W. eds. 1997. 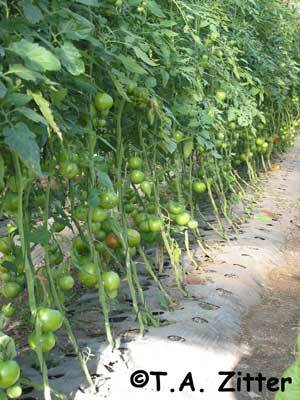 Tomato Diseases - A practical guide for seedsmen, growers and agricultural advisors. Seminis Vegetable Seeds, Inc. Saticoy, CA. Howard, R. J., Garland, J. A., and Seaman, W. Lloyd. eds. 1994. Diseases and Pests of Vegetable Crops in Canada. Published by the Canadian Phytopathological Society and Entomological Society of Canada. Ottawa, Canada. Koike, S. T., Gladders, P., and Paulus, A. O. 2007. Vegetable Diseases - A Color Handbook. Academic Press, San Diego, CA. MacNab, A. A., Sherf, A. F., and Springer, J. K. 1983. Identifying Diseases of Vegetables. The Pennsylvania State University, University Park, PA.
Snowdon, A. L. 1991. 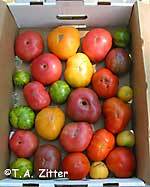 A Colour Atlas of Post-Harvest Diseases and Disorders of Fruits and Vegetables. Volume 2: Vegetables. CRC Press Inc. Boca Raton, FL. Capinera, J. L. 2001. Handbook of Vegetable Pests. Academic Press, San Diego, CA. Cranshaw, W. 2004. Garden Insects of North America: The Ultimate Guide to Backyard Bugs. Princeton University Press, Princeton, NJ. 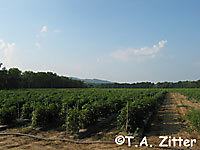 Prepared by T. A. Zitter for web delivery as part of the Vegetable MD web site on April 2007. We gratefully acknowledge the financial support of Cornell Cooperative Extension; Web layout is credited to Dawn Dailey-O'Brien and the studio photographic work of Kent Loeffler is gratefully acknowledged.